EBFA President Franklin Wilson (right) receives the Lien trophy from Ralph Green recently in New York. Federation (USSF) D, C and B (College Level) Ralph Green has agreed to sponsor the league on an annual basis. Green who is a founding member and current President of the Camptown Soccer Club of New York said that he had no hesitation in partnering with the EBFA for this level of football since setting a solid foundation will ultimately see Guyana’s foundation being a solid one. He commended the EBFA for being very active over the past two years in the area of junior football development having run off multiple competitions at the Under-11, 13, 15, and 17 levels. “When the proposal was put forward to me by Mr. Wilson, I did not have second thoughts because I am aware of what the association has been doing under his stewardship and wanted to make my contribution which would be on an annual basis,” Green commented. Green reminded that through the Camptown Soccer Club of New York, they sponsored the biggest Under-15 tournament in Guyana which attracted 16 teams with each player receiving a ball and tee shirt. The EBFA competition will see the teams competing for a 25″ lien trophy with the team to win it on three successive occasions able to keep it. That apart, the first, second and third placed teams will receive medals while the fourth placed team will be presented with participatory medals. There will also be five individual trophies that will go to the tournament’s Most Valuable Player, Highest Goal Scorer, Best Goalkeeper, Most Promising Player and Most Disciplined Player. EBFA’s Wilson said that the association is very grateful to Green for readily agreeing to commit to an annual tournament. He said that this is not the first time Green is contributing to the association, having also run off a two-day coach’s seminar in the recent past. Wilson also informed that the sponsorship agreement has the capacity to be expanded with the benefit of the players at the forefront. Wilson, while expressing gratitude to Green on behalf of the association on a recent visit to New York, also informed that a few more individuals have been approached to make this initiative a reality. He said that it is the intention of the association to take the sport to another level as they seek to expand the sport on and off the field of play despite the many challenges. 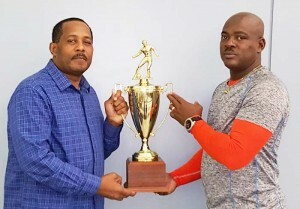 Himself, a Youth Soccer Coach since 1989, Green who currently Coaches Academy players for Woodhaven FC (for the past 16 years) as well as Teams in the Long Island Junior Soccer League underscored his commitment to Guyana’s football which he said would take off. Herstelling Raiders FC are defending champions.